Four Iraqi commandos at the base were among those awarded medals by Defense Secretary Ash Carter during his visit earlier this month. 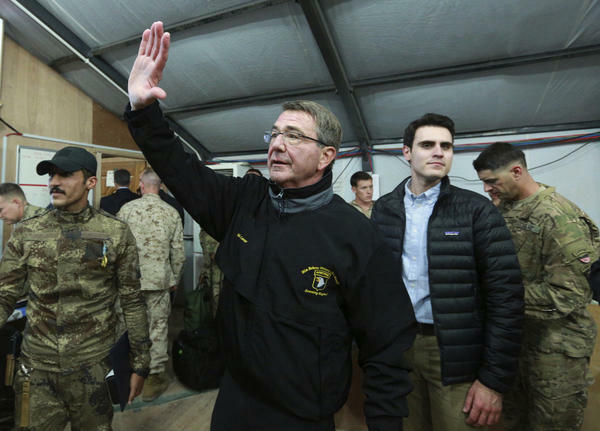 Defense Secretary Ash Carter waves to a group of Iraqi and U.S. soldiers during his visit to the Qayyarah Airfield West, south of Mosul, on Dec. 11. 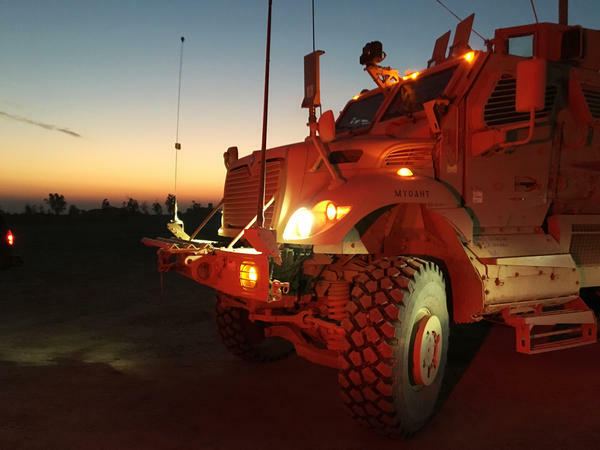 A MaxxPro mine-resistant vehicle transports forces at Qayyarah West. When Islamic State fighters attacked Mosul more than two years ago, soldiers guarding Iraq's second-largest city fled in disarray. Now, with an assist from the U.S., Iraq's security forces are two months into a fierce battle to retake Mosul. This base is now firmly under U.S. and Iraqi control, and it is a key staging site for the assault on Mosul. The late afternoon sun is low, the temperature in the 30s and the air brisk as we follow crushed rock trails over fine, tan dust. The high concrete blast walls lining the base's perimeter cannot shield it from enemy mortars. So everyone piles into hulking, explosion-resistant vehicles called MaxxPros as we head over to what's known as "the life support area." Our destination is essentially a big tent covering a bunker for American troops. They snap to attention as Carter enters. "Happy holidays to you," is the Pentagon chief's greeting to these soldiers from the 101st Airborne Division. "This is not the most wonderful place to spend the holidays, so we wanted to make sure you knew we appreciate it." The troops' bunks — made of foot-thick concrete slabs — are festooned with photos and football banners. "You wouldn't be here if I didn't need you to be here," Carter tells the fresh-faced soldiers. "I need you to be here because we need to protect our people. And to do that we need to defeat ISIL, and the Iraqis could no way ever do it by themselves. And so it's a historic necessity." Carter has also come here to bestow medals for bravery — but not for the 500 or so Americans at this fire base. In a shed that serves as the Combined Joint Operations Command, the defense secretary pins medals on eight Iraqi soldiers — elite troops who have been doing deadly block-to-block fighting in eastern Mosul. "These troops have braved snipers and IEDs and mortars, suicide cars, truck bombs, and more, but they have shown true bravery in battle," Carter tells a small crowd of U.S. and Iraqi officers. "Because of that bravery and determination, I'm confident that they will prevail." After the U.S. invaded Iraq nearly 14 years ago, American troops did most of the fighting. But during the Obama administration, their role has been more to train, advise and assist. Iraqis now do most of the fighting and dying. Pentagon officials say the 5,000 or so U.S. troops deployed to Iraq are there mainly for noncombat duties, such as training local forces or targeting airstrikes. "It's a team effort, so if they get intelligence, they'll come to us with that information and then we'll talk about it," says Marine Capt. Lou Murillo, describing his work identifying potential targets in collaboration with Iraqi forces at this fire base. "If we have intelligence, we'll talk with them and make sure that we are both included on the approval process for it. And then we will send a request up to our higher headquarters and they process the targets from there." "There" is usually Baghdad, where top U.S. commanders are based — and where Iraqi officials must sign off on strikes as well. For the Americans, there are strict White House-imposed limits on the number of civilians who might possibly be killed in an airstrike — usually no more than 10. That complicates carrying out airstrikes in the still densely populated neighborhoods of Mosul, where residents are reported to be used by Islamic State fighters as human shields. Senior American defense officials say Iraqi officials have also blocked targets, including Mosul's central bridge across the Tigris River. They want that bridge kept intact for when Mosul is retaken. 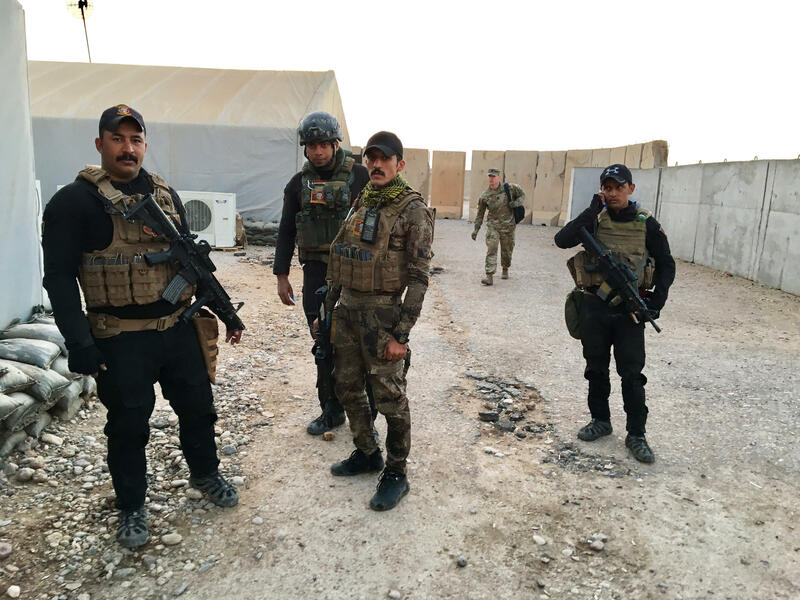 For troops on this fire base, the retaking of Mosul is more a question of when than if. "It's been goin' pretty good. We keep on moving forward, hopefully Mosul before the beginning of the year," says Army Sgt. Brian O'Toole. Carter is certain Mosul will be retaken, though he is not saying when. "We all want to get this done as soon as possible," he says, "but in a war, that's what you have to expect. It's gonna be a tough fight." So tough, in fact, that there's concern that Iraq's American-trained Golden Brigade, which has done the bulk of the block-to-block fighting in Mosul, could soon be crippled by a 50 percent casualty rate. The battle for Mosul could well be one of many hot spots the incoming Trump administration will inherit. For the troops at Qayyarah West, that could mean yet another visit and one more pep talk — from the next defense secretary. When ISIS fighters attacked Mosul more than two years ago, the Iraqi soldiers guarding the city fled in disarray. Well, now Iraq's security forces are two months into a fierce battle to retake Mosul, and they're getting help from the United States military. NPR's David Welna recently traveled with outgoing U.S. Defense Secretary Ash Carter to a key staging area for the assault, and he filed this report. DAVID WELNA, BYLINE: Nearly an hour after flying out of Baghdad, a cavernous C-130 cargo plane touches down at Qayyarah West Airfield. Mosul is just 30 miles away. As recently as July, Islamic State fighters controlled this military airbase. It's brisk and near dusk when a contingent of Pentagon officials and reporters reaches this desert outpost. We follow crushed rock trails across fine tan dust. The space, despite high concrete blast walls, gets hit by mortars, thus the hulking explosion-resistant vehicles called MaxxPros that we're herded into. We ride to what's called the life support area. It's essentially a big tent, housing for American troops. ASH CARTER: How you doing? Happy holidays to you. Not the most wonderful place to spend the holidays, so we wanted to make sure you knew we appreciate it. WELNA: That's Defense Secretary Carter greeting troops with the 101st Airborne Division. Their bunks, decorated with photos and football banners, are made of foot-thick concrete slabs. Carter seems to feel an explanation's in order for why these fresh-faced soldiers are stuck here. CARTER: You wouldn't be here if I didn't need you to be here. We need you to be here because we need to protect our people, and to do that, we need to defeat ISIL. And the Iraqis could no way ever do it by themselves. And so it's a historic necessity. WELNA: Carter's also come to bestow medals for bravery - but not for the 500 or so Americans at this fire base. In a shed that serves as the Combined Joint Operations Command, the U.S. defense secretary pins medals on eight Iraqi soldiers, elite troops who've been doing deadly block-to-block fighting in eastern Mosul. CARTER: These troops have shown true bravery in battle and determination. I'm confident that they will prevail. WELNA: After the U.S. invaded Iraq nearly 14 years ago, American troops did most of the fighting. But in the Obama administration, their role has been more to train, advise and assist. Iraqis now do most of the fighting and dying. Pentagon officials say that 5,000 or so U.S. troops deployed to Iraq are mainly for training local forces or calling in airstrikes. CAPTAIN LOU MURILLO: My name is Captain Lou Murillo. WELNA: Murillo is one of the Marines here working with Iraqis on targeting airstrikes. MURILLO: It's a team effort. So if they get intelligence, they'll come to us with that information, and then we'll talk about it - and then same thing. If we have intelligence, we'll talk with them and make sure that we are both included on the approval process for it. And then we will send a request up to our higher headquarters, and they process the targets from there. WELNA: In Baghdad, Iraqi officials have blocked bombing such targets as the main bridge across the Tigris River in Mosul. The Iraqis want that bridge around for when Mosul's retaken. Outside the command post, Army Sergeant Brian O'Toole says he expects the battle for Mosul will end soon. SERGEANT BRIAN O'TOOLE: It's been going pretty good. We keep on moving forward - hopefully Mosul before the beginning of the year. WELNA: But while Secretary Carter, too, is certain Mosul will be retaken, he won't say when that will happen. CARTER: We all want to get this done as soon as possible, but in a war, that's what you have to expect. It's going to be a tough fight. WELNA: So tough in fact that there's concern Iraq's American-trained Golden Brigade, which has done the bulk of the block-to-block fighting in Mosul, may soon be crippled by a 50 percent casualty rate. Odds are that the battle for Mosul will continue into the impending Trump administration. For troops at the Qayyarah West air base, that could mean yet another visit and one more pep talk from the next defense secretary. David Welna, NPR News. Transcript provided by NPR, Copyright NPR.